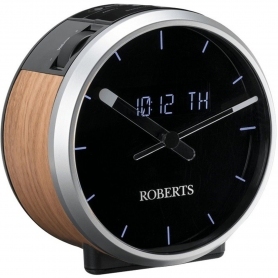 The Roberts Ortus Time is a digital clock radio packed with impressive features, including the ability to stream music from devices. A compact design, with a wood, silver and black finish, makes it a stylish model to place on your bedside table. A large analogue clock face with a clear digital display offers a classic look to suit any interior style. Choose from two alarm timers and wake up to DAB/FM radio, or a familiar buzzer sound. With the option to snooze or sleep the alarm, you can even grab a few extra minutes if you need. Tune into DAB/DAB+/FM RDS radio on this high-quality device, and enjoy 20 station presets at the touch of a button. If you want even more variety, simply tune the radio to discover more options. Whatever your music preferences, you’ll easily find a station to suit you. 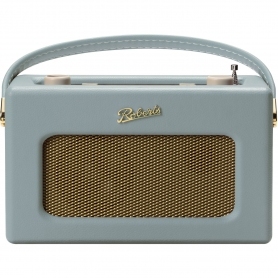 Enjoy rich sound and stunning clarity from this compact Roberts model. Easily adjust the volume and use the loudspeaker to project music around your room. Or, plug in your headphones and listen to the radio privately. Best of all, you can adjust the treble and bass levels to suit your preferences. Go to the ‘My EQ’ settings and increase the bass for powerful sound, or adjust the treble for enhanced higher notes. Experience high-quality sound reproduction from the ORTUSTIME. Roberts’ ORTUSTIME even doubles up as a speaker, so you can listen to your top tracks. Tune in to music from your smartphone or MP3 player by plugging them into the auxiliary input socket. There are also two USB ports, so you can discover more connectivity options. And, why not use one to charge your smartphone or tablet? The Ortus Time by Roberts is much more than just a radio. See for yourself and add one to your basket today.